This name uses Spanish naming customs: the first or paternal family name is Colom and the second or maternal family name is Caballeros. Colom was born in Guatemala City, the son of Antonio Colom Argueta and Yolanda Caballeros Ferraté, being the fourth of five siblings. 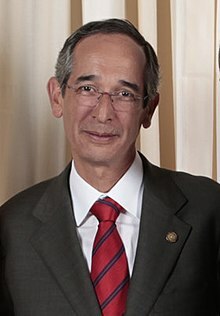 His uncle, Manuel Colom, was a mayor of Guatemala City who was killed by the military in 1979 just after the creation of his political party was approved. He is also the father of Antonio Colom Szarata, the bass player of a Guatemalan pop rock band, Viento en Contra. He and his third wife, Sandra Torres, divorced in 2011 in order for his wife to be able to run in the 2011 presidential election. Representing the UNE (Unidad Nacional de la Esperanza) in the 2003 presidential elections, he lost to Óscar Berger on December 28, 2003–the closest a left-wing presidential candidate had come to winning the presidency since democracy was restored in 1985. He was one of the two candidates to reach the second stage of the 2007 presidential election on September 9, 2007 along with Partido Patriota candidate Otto Pérez Molina. At 10:00 p.m. local time on election night, Colom was declared the newly elected president by over five percentage points, 52.7% to 47.3%, with over 96% of polling places counted, becoming Guatemala's first left-wing president in 53 years. During the presidential campaign, Colom promised to tackle poverty in an effort to reduce the rate of crime in the country. As President, Colom expanded social programs and access to health, education, and social security. These contributed to a rise in the living standards of the Guatemalan poor. In 2010 he appointed Helen Mack Chang, a noted human rights activist, to investigate police corruption and make recommendations for changes. She noted that their low pay and poor working conditions made them open to influence and needed to be addressed. Although he is opposed to the death penalty, Colom stated that he would not pardon those sentenced to death out of respect for the country's laws, although the option to do so was granted in 2008. The last execution in Guatemala, however, took place in 2000 and was since abolished for civilian crimes in 2017. On 13 February 2018, Colom was arrested alongside all other members of his former Cabinet "as part of a local corruption investigation". On 3 August 2018, he was released from prison on a 1 million quetzal bail. ^ Pico, Juan Hernandez.Can Alvaro Become a Social Democratic President? Archived 2012-03-22 at the Wayback Machine," Revista Envio. (accessed February 1, 2010). ^ e.V., Transparency International. "Site no longer exists". archive.transparency.org. Archived from the original on 2016-03-25. ^ Rosenberg Mica and Frank Jack Daniel. "Center-leftist beats general in Guatemala election Archived 2009-05-27 at the Wayback Machine," Reuters, November 5, 2007. ^ "Guatemalan Women Enter the Political Limelight Ahead of Sunday's Elections". www.americasquarterly.org. Archived from the original on 2015-10-31. ^ Menchu, Sofia (13 February 2018). "Guatemala arrests ex-president, Oxfam chairman in graft probe". Reuters. Archived from the original on 13 February 2018. Retrieved 13 February 2018. ^ "Oxfam International chair held in Guatemala". 13 February 2018 – via www.bbc.com. ^ Mendoza, Michelle (4 August 2018). "Guatemala: expresidente Álvaro Colom sale de prisión". CNN (in Spanish). Retrieved 17 April 2019. ^ Lainfiesta, Javier (3 August 2019). "Álvaro Colom recupera su libertad luego de pagar fianza de Q1 millón". Prensa Libre (in Spanish). Retrieved 17 April 2019. "Centrist claims win in Guatemala". BBC News. 2007-11-05.